Albert Einstein? Bernice Bede Osol? Eugene Raudsepp? François de La Rochefoucauld? Dale Carnegie? Apocryphal? I cannot find a good citation. What do you think? Creativity was contagious. Teachers also became interested. They were found taking a few minutes from their lunch time for work on their ceramics, too, and again at home at night. GEMINI (May 21-June 20) Your creativity’s contagious. Seek support for your ideas today. Others will appreciate their potential. Through the process of association of ideas your imagination will find new and relevant relationships between things. Gore Vidal? La Rochefoucauld? Somerset Maugham? Wilfrid Sheed? Iris Murdoch? David Merrick? Genghis Khan? Larry Ellison? Anonymous? It is not enough to succeed; one’s best friend must fail. It is not enough to succeed; one’s friends must fail. It’s not enough that I should succeed, others should fail. 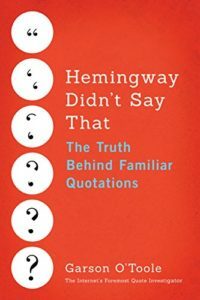 I have heard different versions of these quotations credited to the epigrammatist La Rochefoucauld, the writer Gore Vidal, and the warlord Genghis Khan. Could you examine this topic? In the misfortune of our best friends, we always ﬁnd something which is not displeasing to us. We are all strong enough to bear the misfortunes of others. These are really different maxims, and QI believes that the sayings under investigation should not be ascribed to La Rochefoucauld. A separate post will be created to discuss Rochefoucauld’s words. His companions introduced him to the pleasures of art, poetry, theatre, and friendly disputation. He discovered the Maxims of La Rochefoucauld, and their echoes were heard for sixty years in his plays and stories. On Maugham’s eighty-fifth birthday a journalist reported him as uttering a pure La Rochefoucauld: “Now that I have grown old, I realize that for most of us it is not enough to have achieved personal success. One’s best friend must also have failed.” Fortunately one is not obliged to accept as authentic every statement made by a columnist, and this ill-humored remark is quoted out of context. Some readers may have misinterpreted the phrase “uttering a pure La Rochefoucauld” and concluded that the quotation was composed directly by La Rochefoucauld. But Cordell actual meant that the quote was stylistically and thematically congruent with the maxims of La Rochefoucauld. This similarity has caused confusion between the words of Maugham and La Rochefoucauld for decades as shown in the citations below.